This was, undoubtedly a calculated strategy by Ripple, because announcements, while creating enthusiasm within the business community, have strangely-enough not translated directly to the crypto market. While banking and financial institutions are quickly signing on to pilot XRP in hopes of being one of the early adopters to benefit from lower processing costs, the crypto market seems a bit immature, choosing to reward XRP price more based on rumors of new exchange listings than anything that reflects concrete business results. Perhaps it’s to be expected – new exchanges promise immediate liquidity boosts, whereas long-term business developments, no matter how incredible and potentially earth-shaking, take time to develop. But ignoring business developments is a clear mistake – when it comes to XRP. While other coins in the top ten CMC listing rely almost entirely on volume and demand created from buying and selling among traders with only a few minor exceptions, XRP’s future relies instead not on the kindness of strangers but on rock-solid business use cases such as the market for international remittances. And it’s these use cases and massive volume numbers that promise to eventually dwarf the volume numbers that we’ve seen with Bitcoin or any other crypto. 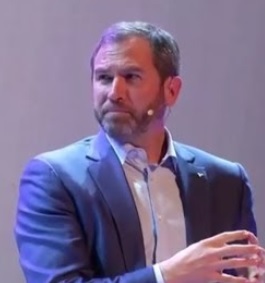 The most exciting other remarks from Brad Garlinghouse at the Asia Money 20/20 Conference had to do with new use cases for XRP. This next quote is a remarkable development because it adds to other evidence that Ripple has reached the turning point in their confidence level at capturing the entire global payments market. Remember, Brad Garlinghouse is the author of the Peanut Butter Manifesto, which emphasized the need for laser-focus on core strengths and use cases, even for companies as big as Yahoo. This is a remarkable turning point, because in my opinion, he would only make this statement or add to Ripple’s pipeline if he was confident that their core use case was already secure. Why am I so confident in making this statement? Because Brad Garlinghouse owns XRP just like you and me. Some readers might think this looks familiar – after all, many ICOs that are hustling for investment have made similar claims about their token providing support for a product. But the key difference between these ICOs and XRP is the high level of speed, liquidity and ease-of-use of XRP as compared to specialty tokens or other popular cryptocurrencies. Another key difference is that Ripple has enormous sums of capital to invest in new businesses that want to collaborate by using XRP. This is music to the ears of crypto market investors that may have a more difficult time understanding the use case dynamics of cross-border value transfer, despite this market’s quadrillion-dollar scale. When the demand from these massive remittance processors makes itself known, 2018 might transform into a very memorable year for XRP. The XRP Investor community is eager for any detailed information about the Ripple solution packages (xCurrent / xRapid / xVia) and their respective integration with XRP, and specifically how each affects potential demand for the digital asset. 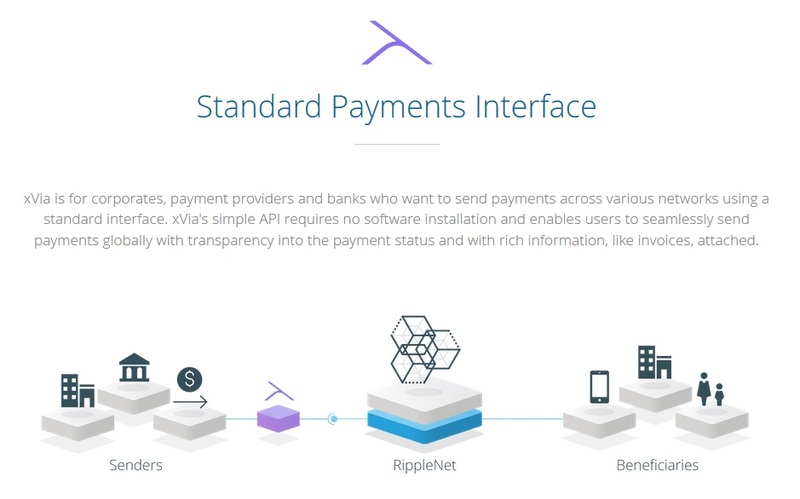 After Ripple standardized these packages and their respective descriptions and content on the official corporate website, it became easier to have meaningful conversations about XRP adoption that might result from Ripple business dealings and progress. The sometimes-overly-simplistic definition that’s been handy to use involves an assumption that anything having to do with xRapid has the potential to directly affect demand for XRP, since XRP is sourced for liquidity within that solution. Recently, however, finer-grained information has come to light or been otherwise emphasized to remind us of the true capabilities of both xCurrent and xVia. 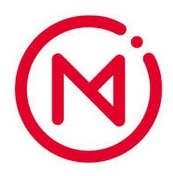 Oftentimes, we hear about xCurrent being used by a new Ripple customer, and the assumption is that it’s an ‘either/or’ type of situation, and that the customer is opting to turn away from the possibility of using a digital asset for sourcing liquidity. This recognition of a possible dual configuration confirms what we’ve suspected; that xCurrent may be a comfort-level choice for some conservative institutions such as banks or financial institutions; however as regulation becomes more well-defined they may eventually flip the switch on using digital assets. This is welcome news and emphasizes the concept that Ripple technology adoption is generally good for XRP adoption. This public-facing introduction is high-level; however, if we look back to a short Reddit post by David Schwartz, Ripple’s Chief Cryptographer, we can see that XRP can in fact be utilized by this solution. “Others have explained what it is and what it does, but I'd like to point out how it fits into our XRP strategy. Imagine if you're a large corporate that has to make payments to people all over the world (like Amazon or AirBNB). If Ripple's FI strategy is successful, there will be lots of ways you can use Ripple's payment system to make payments to many of those customers. But if the XRP strategy is successful, you'll wind up paying about twice what you have to -- once to get into XRP from the source and once to get out of XRP for the destination. So why not save money by holding a pile of XRP instead? 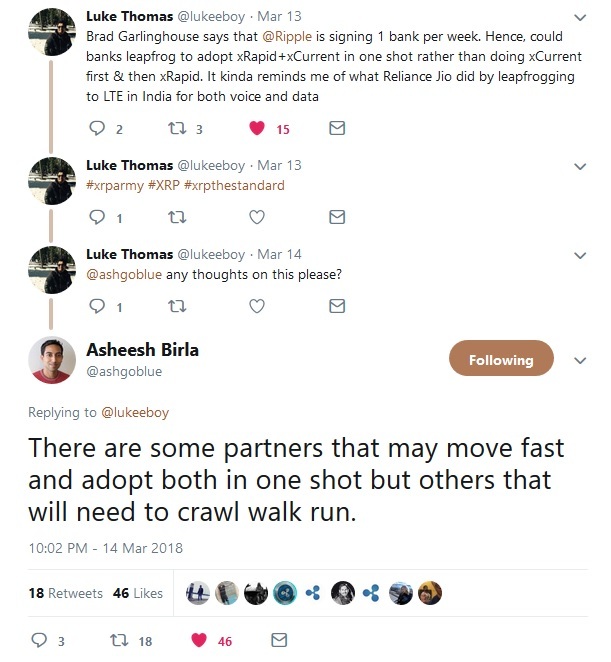 This an exciting additional piece of evidence that each of the Ripple solutions can interact and/or otherwise support adoption of XRP for liquidity. As we learn more about how each of the Ripple solutions solves massive business use cases while at the same time advancing the use of digital assets in real-world cost-cutting situations, excitement about XRP continues to grow. It was impossible to ignore the continued drumming of the crypto market from the continual volatility being visited upon it by Bitcoin. Various theories have been put forward for the cause of the early 2018 Bitcoin downturn and troubles. Was it the selling of Bitcoin on open exchanges rather than OTC markets by the Mt Gox Trustee? 9 Was it intentional manipulation of the Bitcoin futures market by large BTC whales? Or perhaps it was because the unbridled enthusiasm on display in December of 2017 has now given way to recognition that regulation is on the horizon? Each one of these theories seems to have a grain of truth, but beware the tendency to believe in one instead of an honest combination of these factors. Whatever the cause, the result was readily apparent on the crypto markets. To determine if there’s any serious, permanent cause for concern, we only need to consider one of the possibilities: regulation. The other two involve temporary drivers that will eventually have to give way to overall global demand for cryptocurrency, which, like the censorship-resistant networks themselves, cannot be stopped. The only factor that will have a permanent effect on crypto markets is the influence of regulation. It’s no surprise that crypto will be regulated. Despite the censorship-resistant decentralization offered by crypto networks, if they want to access any significant amounts of money and value throughout the world, they must utilize an exchange of some kind. Despite the development of some decentralized exchanges, most of the high-volume exchanges are based on centralized businesses that can successfully integrate with banks and perform KYC and AML procedures. This catch-22 for crypto results in one unavoidable fact – even for the staunchest anarchist crypto fan: The rule of law is now being introduced into crypto. Emphasis was given to scalability issues, with no mention of how Ripple solves this problem. Despite the low-market cap of crypto, it compares the market to massive historical multi-trillion-dollar bubbles. The term “irrational exuberance” was used. It warned about massive capital flowing to ICOs and talked about the Ethereum DAO theft. Hacking and poor exchange security was discussed. Miss-use of cryptocurrency by black markets was highlighted, with the obligatory mention of Silk Road. This was a very appropriate way to end this chapter of the report, and I’m encouraged that legislators recognize the potential value of having the US be a leader in the industry. Do I think it’s enough? No. I’d like to see more tangible actions taken to make crypto trading and innovation more profitable for individuals and businesses here in the United States. Did you see the headlines about PayPal filing a patent? Reading the news coverage, I had one immediate thought – they could shorten wait times by using XRP. XRP not only handles up to 50,000 transactions per second using its Payment Channels capability, it settles with finality in under four seconds. Contrast this with Bitcoin, where settlement only happens with six confirmed blocks, which usually takes one hour or more. Taking a page from SWIFT’s head-in-the-sand playbook, PayPal (strangely) opted to ignore the idea of using Ripple technology to enable real-time payments, and instead wants to develop a high-tech set of crutches to help Bitcoin hobble from buyer to seller faster. This consensus among the financial and banking sectors underscores and makes apparent that the crypto market space is not impartial in its promotion of one cryptocurrency over another. Existing financial interests can sometimes dramatically illustrate just how much of a first mover advantage Bitcoin possesses – and it’s now just coasting on its current market share, watching it slowly decline as banks, financial institutions, and remittance processors opt for true cost reduction through Ripple technology. Hopefully PayPal executives pose some of these challenging questions internally – it doesn’t make sense for an entire corporation to risk it’s future on a very questionable strategy for enabling Bitcoin payments at the expense of other cryptos. Perhaps we’ll be surprised, however; maybe this new patent will not only support Bitcoin payments, but others as well? Maybe it’s only the first step of many that PayPal is planning on making to step over into truly modern payment processing – and maybe they’ll wake up one morning and decide to join the growing ranks of big business that are adopting Ripple technology – and using XRP for liquidity. Right now, we can move information across the global expanse and even to the space station and back in seconds, but moving value across artificial, human-created borders takes days. Regardless of the reasons that people point at, it’s far past time that the promise of technology is realized for the sake of the global economy. Globalization has long been thought of in terms of avoidance of responsibility by large multi-national corporations, but if we take a look through the lens of supercharging global commerce and enabling value to multiply the velocity of money, excitement starts to increase for crypto technology like XRP. What this means is that in addition to moving the speed of cross-border value transfer from days to real-time, Ripple’s goal is also to decrease the cost of money transfer by a factor of ten. This is a dramatic prediction to make, but keep in mind that Ripple is a company with superb insight into the obstacles and opportunities within the payments space. They’ve analyzed each of the costs involved in the legacy processing of payments, and have been able to form a technology-based solution for each of them while also supporting the regulatory requirements of the global payments infrastructure. In crypto, many of us have become immune to much of the spin that professional marketers try to provide new digital asset offerings; in the case of Ripple, the history of real business results is easy to access and observe for yourself.